Although kitchen marble slab looks strong and durable, but marble countertops are sensitive to chemicals because they are made of a porous mineral. Due to the porosity of the material it easily absorbs liquids that come into its contact. Thus, take proper care of these slabs is crucial. Here we are listing a few really important and simple tips that can help you keep kitchen marbles shining bright and spotless. While cooking if something spills on the marble countertops, clean it instantly or the liquid could mark the surface. Always protect the stone surface by using trivets or mats, because items with sharp edges and hot items could damage the surface. Also, make sure that you keep bottles on a tray to prevent stains. Avoid cutting fruits, vegetables etc. on the surface, as it could scratch the material. Sealing the counter surface is also important for preserving the condition of the stone. Sealed marble prevents staining because the sealant removes the porosity of the material. The marble is sealed during the installation, but gradually the sealant wears off. Thus, it is important that you reseal your countertop from time to time. Depending on your usage of marble countertop, you need to reseal it once or twice in a year. Another issue with Edmonton marble countertops is that of etching. With etching, acidic substances will remove the shine from the surface, making it look dull. If etching occurs, by polishing the material you can restore its beauty. To keep marble countertop beautiful, clean it regularly. Just wipe the surface with a wet cloth to remove soiling and dirt. Never leave the surface damp or wet. Also do not use chemical cleaners like acidic cleansers, and bleach to clean the stone surface. Chemicals could etch the surface of the counter and make it dull. 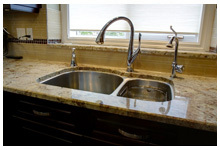 You can ask your marble slab suppliers about the care and maintenance needs of your kitchen countertop.